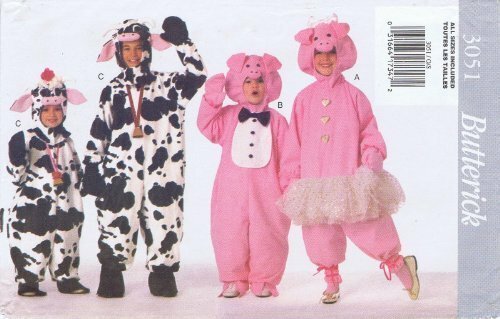 Pattern and instructions for making Boys'/Girls' Cow or Pig Costume: Very loose-fitting jumpsuit has back Velcro closing and elasticized lower edge of long sleeves, legs and tail. A: button trim and ruffle. B: detachable contrast bib, bow and button trim. C: contrast cuffs. 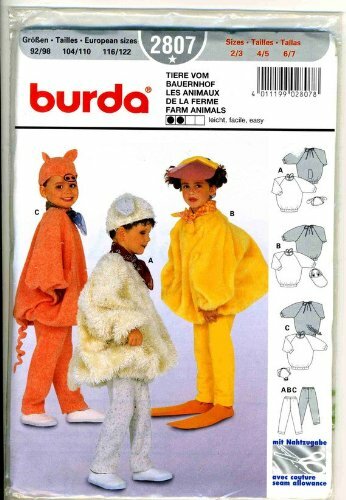 Hood with stuffed stay, face variations and front Velcro closing. Mitts and spats (contrast C) have elastic. 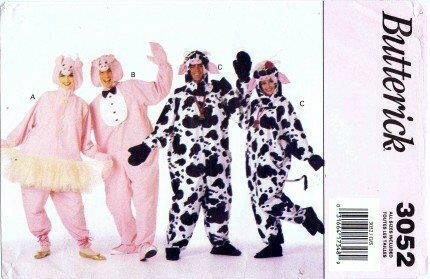 B,C: elastic stirrups. Purchased trim and cow bell. 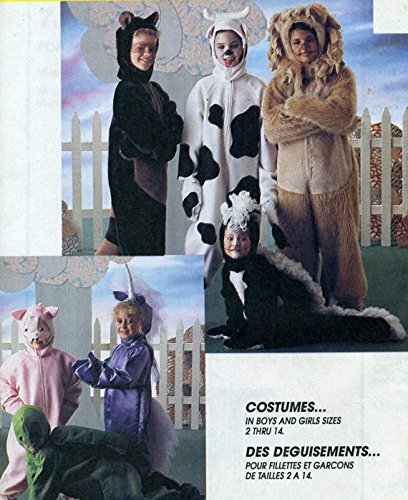 Unisex costume: Very loose-fitting jumpsuit has black Velcro closing and elasticized lower edge of long sleeves, legs and tail. A: button trim and ruffle. B: detachable contrast bib, bow and button trim. C: contrast cuffs. Hood with stuffed stay, lace variations and front Velcro closing. Mitts and spats (contrast C) have elastic. 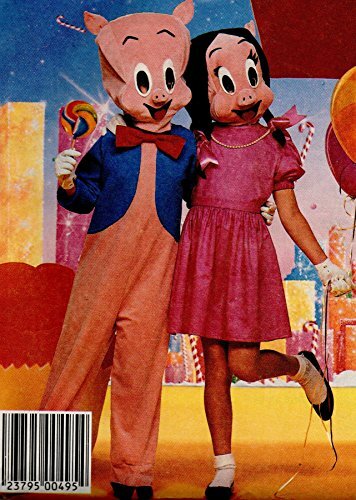 B and C: elastic stirrups. Purchased trim and cowbell. 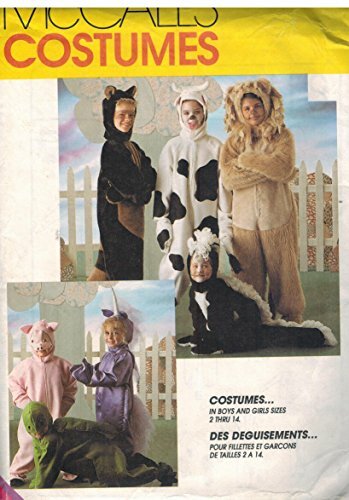 Includes pattern and instructions to sew costumes including raccoon, skunk, lion, turtle, unicorn, pig and cow. 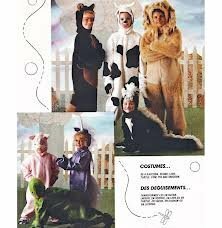 Sewing Pattern and Instructions for making farm animals costumes: duck, lamb and pig. 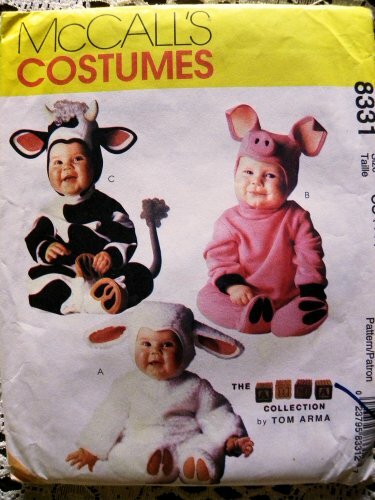 Each is made up of a top, a cap and leggings.